Born Charles-Édouard Jeanneret-Gris, Corbusier (6 Oct. 1887 – 27 Aug. 1965) renamed himself in the early 1920s as his design ideas around urban housing and standards of living began to trend. Not an architect by trade, Corbusier helped determine the Brutalism movement along with his cousin Pierre Jeanneret and inspiration from friend Walter Gropius, founder of the Bauhaus. The vast, interconnected exterior of Corbusierhaus in Berlin. Brutalism fostered the ideas of raw, exposed concepts and basic-human-function, working largely with concrete and angles of light. Far from ornate, the style of architecture was more suitable to government style buildings due to their somewhat austere nature, despite their unusual beauty. Known widely though his Modular Man and Golden Ratio concepts rationalising Brutalism, Corbusier suggested the ideal building demanded the dimensions of 2.26 metres in height and efficient use of space and light were vital to ensure simplistic, minimalist and affordable high-density accommodation for urban dwellers. The southern tip of the Corbusier building recently renovated. The whole building is currently under restoration in phases that will take about 20 years to complete. Trending anti-bourgeois style, Corbusier and Jeanneret worked to develop the somewhat Soviet style design based on the Modular Man and Golden ratio concepts, a system that was a continuation of Leonardo da Vinci’s Vitruvian Man. Both used the proportion of a standard sized Anglo-Saxon male (at the time) to improve the function of architecture. Searching for an effective way to deal with population overload in Paris during the 1920s Corbusier worked on his Brutalist notion developing modern forms of architecture that would provide quality housing for the lower classes. Large concrete blocks raised on pilotis formed the structural foundations of the house. Resembling cells, the apartments were interlocked within the concrete block and with no need for supporting walls; apartments that all included a living room, kitchen and bedrooms could easily fit into the block that included a rooftop garden and a mini supermarket. Each apartment emphasised an open floor plan and were build on angles to make efficient use of natural light from the wide ribbon windows and double featured balconies. 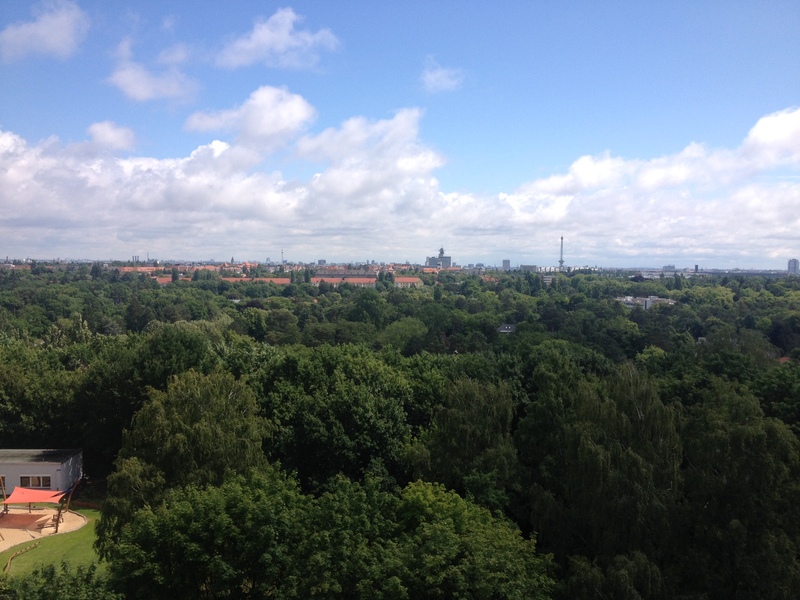 Views overlooking central Berlin from one of the 570 balconies. There could not have been a more suitable designer to take part in the 1952 – 57 International building exhibitions than Le Corbusier. The vacant area on the outskirts of West Berlin near the Olympic Stadium was where Corbusier won the opportunity to build his Streets in the sky or Unité d’Habitation. This move not only allowed West Berlin to compete with the East but to also provide urban housing solutions to the growing number of residents flooding into the city. 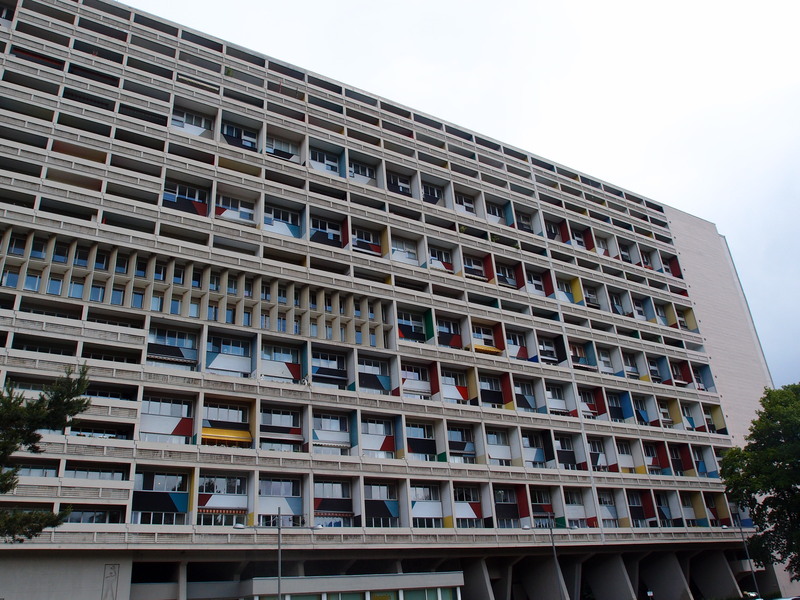 Corbusier’s apartment building was a carbon copy of his original Marseilles invention – the same would be erected in India and across the Soviet block too. 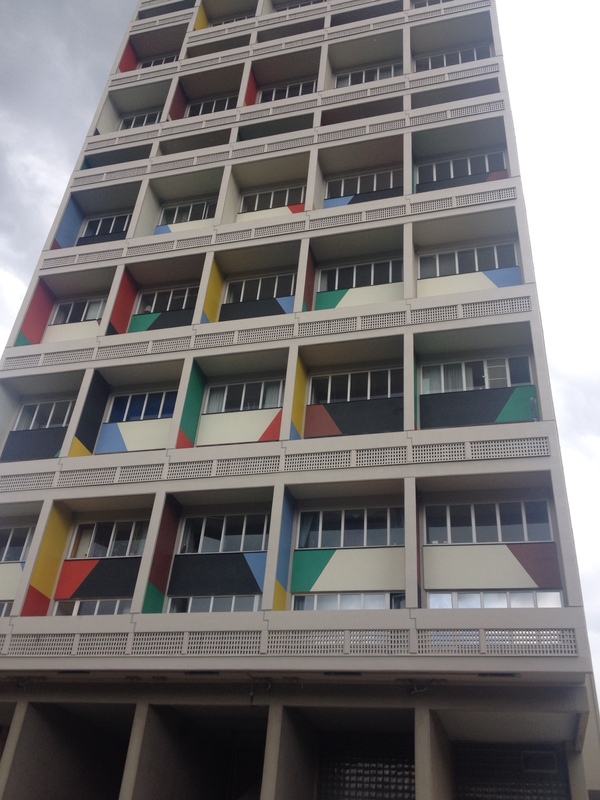 However, due to German building code regulations, variations to the design were required including changing the ceiling height of the apartments to 2.50 meters, something that almost saw Corbusier walk away from the project. 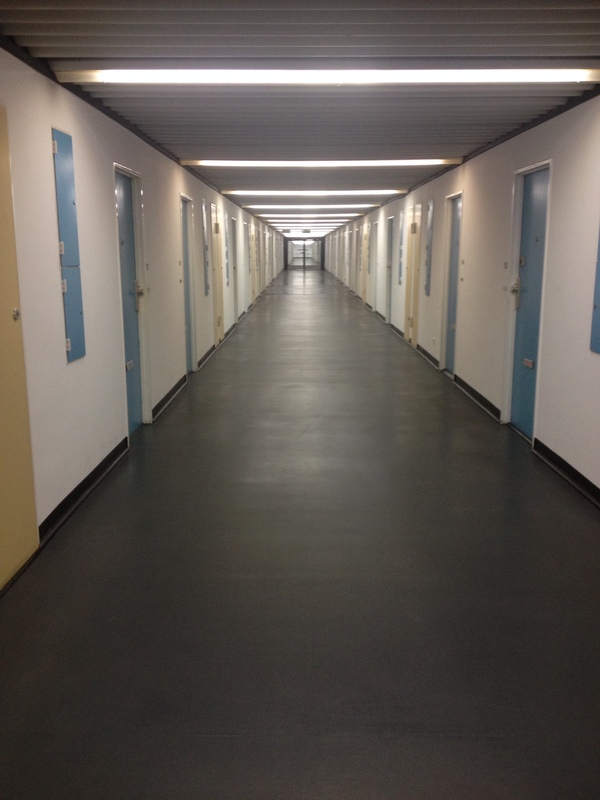 The somewhat austere hallway on the fifth level of Corbusierhaus. Each level is designed with splashes of original colour that is regularly updated. This level I believe is a homage to Abba. Other levels include orange and red. Since 1996, the Corbusierhaus is an heritage listed site and with the renaming of the stadium to Reichssportfeld soon after, the house is home to 530 apartments across 17 floors accessible from ten streets as well as a well serviced S-Bahn and U-Bahn. The exterior of Le Corbusierhaus is free to visit however; private tours of the building are available for 50 Euro per group by appointment only. Run by an eager tenant, the tours include much of the history discussed in this article and usually a tour inside the tenant’s own apartment.